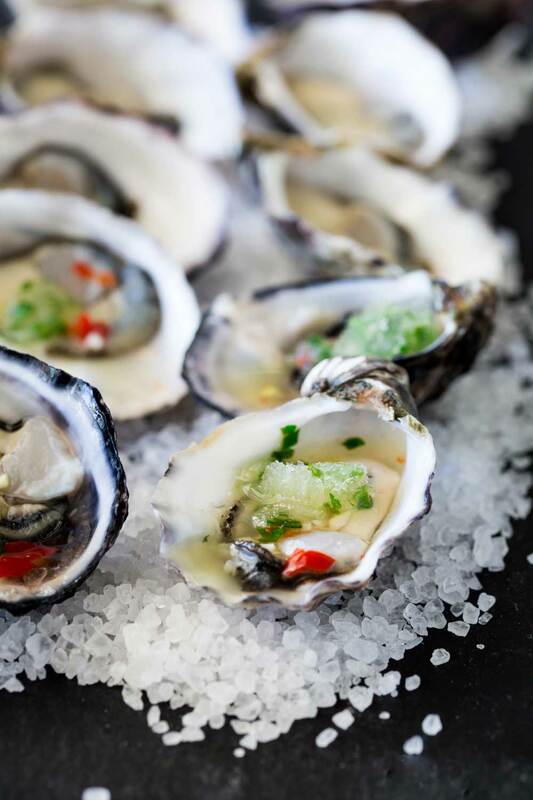 These Thai oysters are dressed with a sweet and spicy dressing and then topped with a cooling salty sour granita. The perfect balance of flavours. If you love oysters then I know you will love these babies! So after posting a few warming winter dishes. I thought perhaps I should give my Northern hemisphere readers a chance. As cold as I know an English summer can be, I am sure you don’t want to be eating soup and pies every day. And with a massive heat wave hitting parts of the US, I am sure you are avoiding soups too! I love oysters, but I do prefer them raw to cooked. Sat at the beach, eating oysters dressed with lemon and a bit of salt! Yes!!! Maybe with a little glass of bubbly and a setting sun….seriously doesn’t that sound romantic!!! Today though I am sharing what might be my favourite way to enjoy oysters. 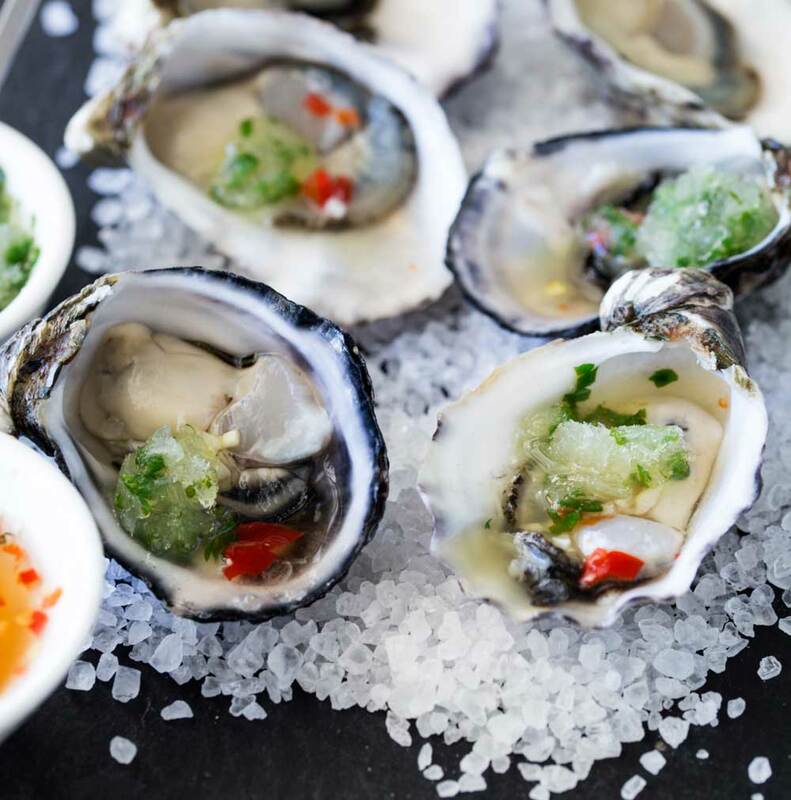 Thai Oysters with a Lime and Cucumber Granita. The Granita needs a bit of prep so it isn’t an instant fix. 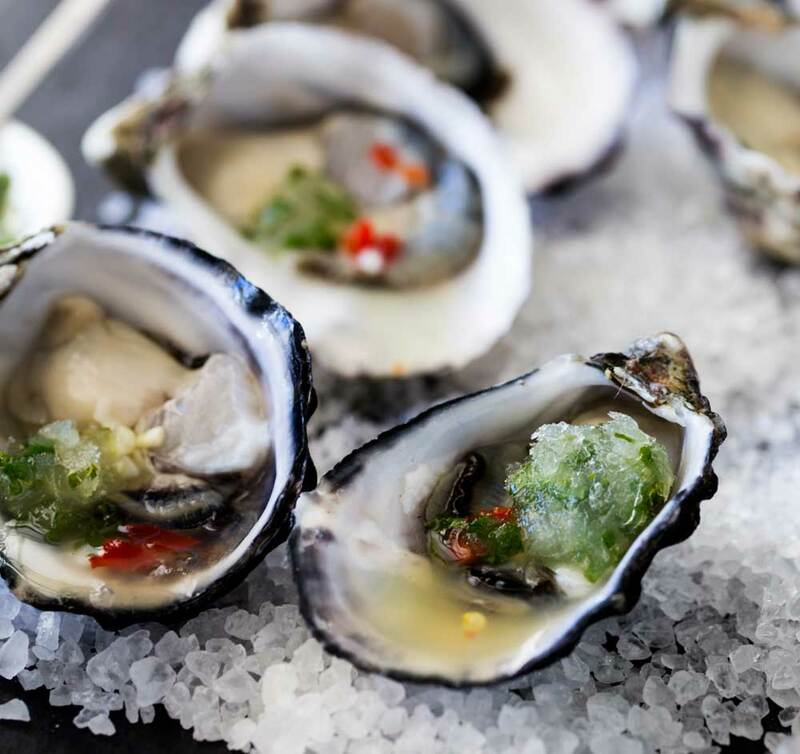 If you are looking for something quick then try my WA day Oysters, oysters dressed with a apple mignonette. The oysters and the dressing don’t take much prep but the granita does. Now push comes to shove you could skip the granita. When my sweet friend Emily came around a couple of months back, I whipped up the dressing and just served the oysters with that. They needed a small sprinkle of sea salt, but they were still delicious. But if you have an evening with friends planned and have the time to whip up the granita then I totally totally recommend it. It is a salty sour hit. Which works so well with the sweet spicy dressing and ozoney oysters. Anyway, in the book he described the first time he ate oysters and his preference for the one bite method. Having never eaten them before and being a massive fan, the first time I ate them I followed his lead. I will never go back. Nigel Slater is a bit of a food hero of mine and if it is good enough for him then I will never argue! So dress your oysters, tip your head back, take a bite and them swallow them with the spicy sweet dressing and salty sour granita. I promise this is heaven. Well it is heaven if you like oysters!!! Stew will always try one, but he is yet to be convinced! I feel I still have time! I have convinced him on olives, avocados and anchovies……we have a few decades left. I should get oysters in there one day???? I have managed to convince my Dad! Last year at Little Creatures Bar, he tried one. He enjoyed it but said it wasn’t something he would eat a lot of. I am taking that as a win, well at least a start? P.s How do you enjoy your oysters? Are you a raw or cooked kind of person? And do you swallow them whole? Or take a good bite! 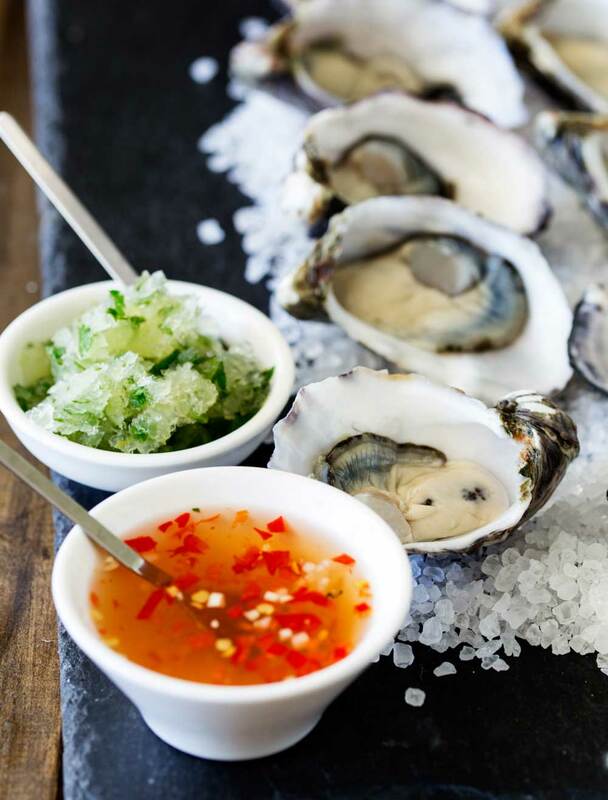 If you love this recipe for Thai Oysters why not subscribe to my newsletter, then you can have delicious recipes straight into your inbox. What is more, as a thank you I will send you my soup ebook for FREE! Start by making the granita. Grate the cucumbers and place them in a colander over a bowl. Sprinkle over the salt and set aside for 10 minutes. Squeeze the cucumbers to release any extra moisture and then discard the flesh. Add the lime juice, lime zest, water and chopped coriander to the cucumber juice. Give the mixture a taste. It should be sour and salty. Pour the mixture into a shallow plastic container and place in the freezer. Allow to freeze for an hour and then use a fork to scrape the semi frozen liquid away from the edges. Stir and scrape the granita at 30 minute intervals until it is light and granular. Once it is ready it should be easy to spoon and scoop. To make the dressing. Gently heat the rice wine vinegar until you can only just hold your finger in it. Add the grated palm sugar. Add them to the vinegar mixture and pour into a small bowl to cool. Serve the oysters on a bed of salt or ice with the two dressings on the side. Perfect recipe to go with a Thai lunch I’m having for friends on the weekend. Sadly the oyster supplies here in Noosa are limited (I migrated from Sydney) but at least the weather is gorgeous. I really like your website and the fonts you are using. Oh no!!! 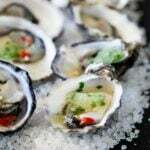 I have heard such great things about the shellfish in Noosa!!!! Such a shame you can’t get oysters! I’d be more than happy with the Thai dressing, but that granita would be like icing on the cake! Actually perfect for the warm and balmy day we’re having here in Sydney today. Who said it was the middle of winter? John, yet again you are making me jealous!!! Balmy weather???? I had to de-ice the car on Sunday!!! An icy windscreen in WA!!! What??? The granita has a great salty hit, which I love with oysters. I know right!!!! Couldn’t believe it when I saw you were talking about him too! Hi Claire! These sound wonderful! A few months ago we went to a bar in Knoxville solely because they have oysters! I don’t understand people just swallowing them, I mean what’s the point. I bite the fatty part because I want to taste them! I totally agree, Dorothy. I love the flavour of them, I want to taste that. And they aren’t cheap, if you are spending good money on good food then you want to make the most of it.